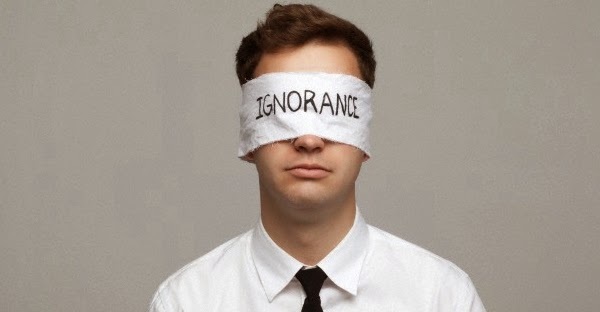 Within this post I am going to share a question that I have been expressing while being with some workmates, friends and family with regards to the word Ignorance. The question goes as it follows: Does being an Ignorant make me Innocent or Guilty? I have heard that being an Ignorant makes you Innocent, just like a child when he/she is discovering the world and sometimes “makes mistakes” without knowing how to manage a specific event, because he/she had never experienced it before. 1. Lacking in knowledge or training; unlearned. 3. Lacking knowledge or information as to a particular subject or fact. How have I experienced this in my life? The other day I had to buy new tires for my car and my dad said he wanted to go with me. For you to know a little bit more about my dad: He is very organized, he always writes down the prices of everything and he knows where to buy the cheapest things in order to save money/not unnecessarily waste money. I could say he is well informed towards the things he participates in. Well, it was going to be the first time I had to buy tires. To me they all looked the same, but soon I realized that there are different models, brands, sizes, etc. So I extrapolated the tires thing to what I do; play the guitar. When you want to buy strings for your guitar you have different sizes, brands, colors, models, etc. so probably for a person who has never bought strings before, they all look the same. This happens when we are going to buy/do something for the first time, so we could say that we are all Ignorant at a certain level, because as long as we experience ourselves with new stuff, we will be acquiring more knowledge/information/wisdom and we will stop being ignorant at those points once we have already faced them - apparently. Now - Let’s imagine I go alone and completely Ignorant to buy the tires for my car and I lack of knowledge and information. Then after buying the tires I realize I bought the wrong size and the car feels so heavy that it makes it hard to drive. Should I say that am I an innocent being or a guilty one? I could probably say “I’m Innocent, because it was the first time I was going to buy tires, so I am just learning”. And I could also say “I’m Guilty, because I knew I was lacking of knowledge. I didn’t investigate more, therefore it was my fault”. Both sentences sound honest. Probably I would be Innocent and Guilty at the same time if I go completely ignorant to buy the tires for my car. 2. A feeling of responsibility or remorse for some offense, crime, wrong, etc. And just to add a little bit more ; the Antonym of the word “Guilt” is “Innocent”, therefore, it’s a polarity manifestation. One concept cannot exist without the other and vice versa. So - What word better defines when you are Ignorant instead of Guilty or Innocent? - Accomplice. 1. One who participates in the commission of a crime without being the principal actor. 3. One who assists a lawbreaker in a wrongful or criminal act. Why do I say that Ignorance is more related to an Accomplice than to Innocence or Guilt? Because when one is going to participate in something “new” or that never did before, one has the (Self) Responsibility to be aware in order to see a new opportunity to learn something. I am not saying that to be more informed or educated means to acquire all the knowledge and information of the world- that’s impossible. - It’s only necessary to be clear about what we are doing so as to avoid experiencing this feeling of remorse or guilt as a negative manifestation as a consequence or even justify yourself saying that you are Innocent, because you think, believe and perceive that you haven’t done anything wrong, therefore you think you are still positive and you want to remain there, because you don’t want to face yourself. The Accomplice is a secondary participant. It’s the one who delegates his/her responsibility to the system and then he/she can say “I didn’t commit the crime I was just there, I participated, but it wasn’t my idea. I never thought this would end up like this. I am innocent”. Therefore, being an Accomplice/Ignorant places you in a position where you have to use Free Choice wherein you can define yourself as Innocent (Positive) or Guilty (Negative) and we all know what that entails. - If you don’t… are you Innocent or Guilty? The Accomplice could also be the one who has no clear direction. He/she is only following something/someone because he/she needs to get something and the action of only "following" and not "leading", gives the perception that one is innocent, because he/she was guided/persuaded/cheated. The Follower does not dare to "Lead", because he/she has placed himself/herself in an inFEARior position and tries to get something through the leading of another one, without allowing self to expand his/her real utmost potential. Therefore, he/she is just living something through someone, but not as self because it depends on something/somebody else to make it exist = it's not real as One. This is what I have learned in the last few weeks. I am not saying this is the truth. It’s just that it makes sense to me. You don’t have to beLIEve me. Doubt it. Investigate on your own.